First Icelandic horses appeared around 900 AD, when they were brought by the Vikings from Norway. As the climate in Iceland was severe, only the strongest horses managed to survive. Soon the Parliament made a law, which banned import of horses from outside the country. The idea behind the bill was to prevent any foreign diseases, however it also helped to protect and maintain the unique breed of Icelandic horses. This law remains till now, that's why Icelandic horses are one of the purest breeds in the world. Not only foreign horses can't be brought to the country, but Icelandic horses, which were exported from Iceland can't come back. In 1780s most of the horses were destroyed by Laki volcano eruption, fortunately the breed survived. 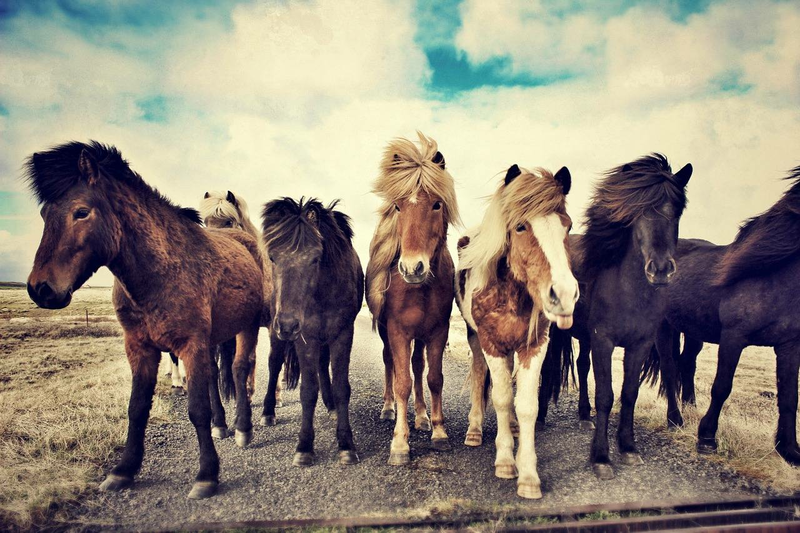 Icelandic horses are relatively small, they usually has a height of 130-140 cm, which is usually the size of ponies. One of the reasons, why they are considered horses despite the small frame is that they manage to carry weights similar to other breeds of horses. Icelandic horses come in various colours, funny fact: there are approximately 100 words that describe different colour patterns of these animals in Icelandic language. In addition to classical gaits, such as walk, trot and gallop, Icelandic horses also have tölt and flying pace. The first one is famous for its comfort, whereas the latter is known for high speed and smooth, it is even possible to reach 48 km per hour! Icelandic horses are used for several reasons: races, meat, farming, however, they are also very popular among tourists. There are many companies, which offer horse riding tours for both adults and children. One of the main advantages of such trips is that tourists get a chance to explore areas, which are impossible to reach by cars. And of course it gives you a chance to learn more about these beautiful animals!